Now that we are beginning to see how our project is shaping up, to get water and sanitation into the Hastings Sierra Leone schools, we need to do some serious fundraising. 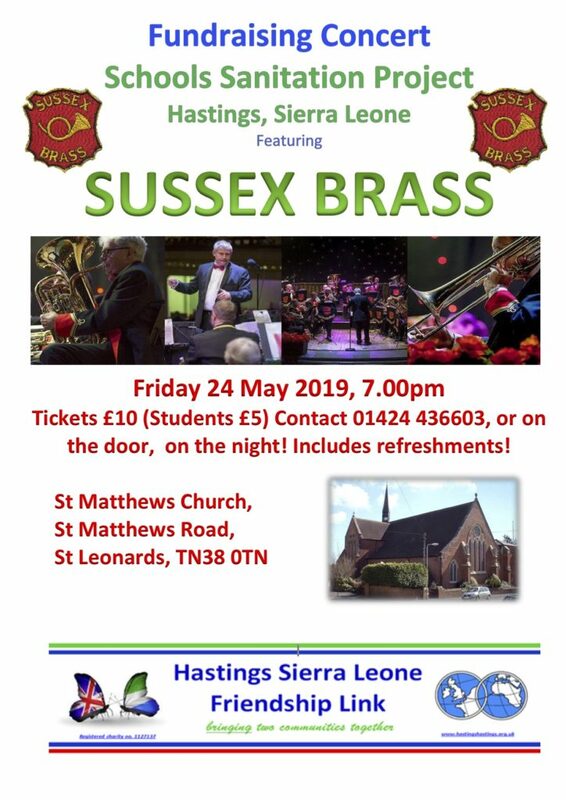 Brilliant local band Sussex Brass have offered to put on a concert for us on Friday 24th May. Everyone loves Sussex Brass – an evening with them is always full of good music and good humour. Details below. Light refreshments are included, so it’s an inexpensive evening’s entertainment for a good cause. You can contact the Secretary on 01424 436603 or secretary.hslfl@gmail.com, to book a ticket or tickets, and they’ll be waiting for you at the church door for you to pick up and pay for. Hope you can make it! You can buy your tickets online using Paypal. When you’ve completed the purchase, you’ll be redirected to your electronic ticket which you should print and bring to the event.